pHOx Ultra can be custom configured with as few as 5 tests to as many as 20 tests to satisfy the exact test menu requirements of each department. However the complete test menu does not have to be run on each sample. Up to 30 specific user-defined subsets (panels) can be created for patient populations such as pulmonary, surgical, pediatric, or emergency care. Phox Ultra incorporates a large, high-resolution color display. The large format, bright colors, and high resolution provide exceptional viewing, and easy-to-read graphics and data. Multiple pHOx Ultra analyzers can be networked together into a single, common database. 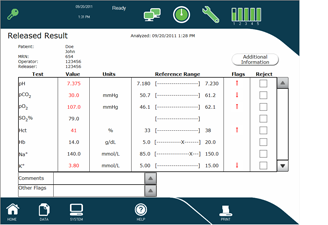 A supervisor or authorized operator can access all patient results, QC results and reports from all analyzers. Competitors often offer this capability only as an expensive accessory, adding 30% – 40% to the cost of the analyzer. pHOx Ultra analyzers are compliant with industry standard POCT1-A2 and ASTM communication protocols for connectivity. These industry standards are used to easily interface pHOx Ultra analyzers to a wide range of connectivity systems including LIS, HIS, and middleware systems. An automated, true QC system eliminates all user steps involved in performing multi-level, true liquid QC, dramatically reducing labor while maintaining the most stringent QC. 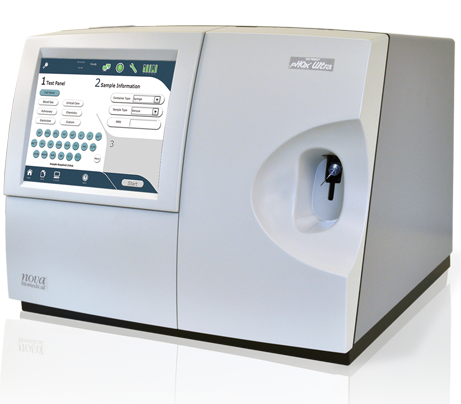 A unique technology feature of pHOx Ultra analyzers is the ability to measure hemoglobin, hematocrit, and oxygen saturation on each sample. Advanced biosensors, optics, and algorithms enable measurement of these parameters without the added cost, hardware, and sample volume of a CO-Oximeter. pHOx Ultra provides ionized magnesium as part of its electrolyte panel. Ionized magnesium is a very important electrolyte for cardiac health. This electrolyte works with potassium and calcium to maintain strong and rhythmic cardiac contraction. It is the most common electrolyte abnormality among post operative intensive care patients. Stat Profile pHOx Ultra hardware and software designs are based on the extraordinary reliability of previous generation pHOx analyzers that have been proven in thousands of installations during the last decade. pHOx Ultra combines long life sensors plus low cost reagent cartridges to provide the most cost effective way for a hospital to offer critical care blood gas testing. pHOx Ultra provides a 20-test critical care profile at a cost equivalent to testing performed in the central laboratory. Other point-of-care devices that use single-test or 30-day sensor cartridges can be 5-to-10 times more costly. The pHOx Ultra comprehensive on-board Data Management System eliminates the high cost of purchasing a separate data manager. The Data Management System enables networking of multiple pHOx Ultra analyzers, reducing connectivity and record keeping costs. 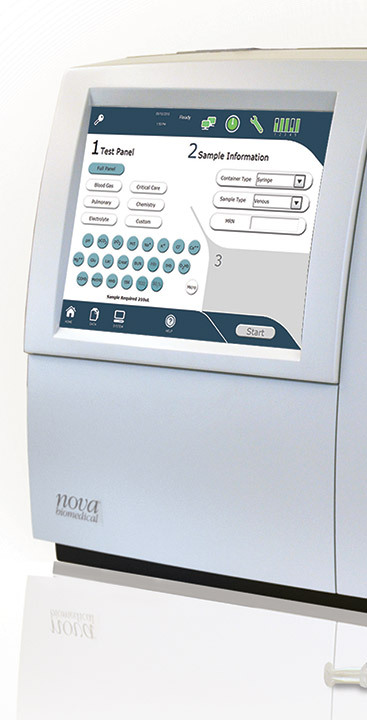 Certifications and Compliance: Nova Biomedical is certified to FDA Quality System Regulations and EN ISO 13485:2016 Complies to IVDD Tested according to: EN 61010-1:2010, EN 61010-2-101:2015, EN 60825-1/A1:2014. CSA Standards Patented Technology. Patents 6,287,451 / 6,837,976 / EP 1 212 609 / CA 2,375,092 / EP 1497 449 / JP 405 0078 Specifications subject to change without notice.